Here are the Steelers inactives for tonight’s preseason game against the Bills. Here are the Steelers inactives for today’s game against the Bills. The last time EJ Manuel started at quarterback for the Bills, Thad Lewis was on the practice squad. Now he’s Manuel’s backup and that will change the dynamic of how Lewis can help be an extra set of eyes for Manuel during the game today against the Steelers. During Manuel’s first five starts this season, Lewis was up in the coaches’ booth and could not communicate directly with Manuel until halftime in the locker room. That won’t be the case now with Lewis moving to the sidelines. Lewis’ first career NFL start came last season in the 2012 season finale for Cleveland at Pittsburgh. The Bills backup QB has also tried to impress upon Manuel that he doesn’t have to try to do more than what’s required of him within the game plan in his return to the lineup. The Steelers have long relied on a solid running game and pressure defense to carry them to victories. Neither of those elements has been present in most of Pittsburgh’s games this season. As a result they’ve had to rely on Ben Roethlisberger delivering a big play to try and move the ball and score points. Roethlisberger hasn’t been bad in providing some of those plays as the Steelers rank seventh in the league in plays of 20 yards or more with 37 in eight games. At the same time they’ve become a predominantly passing team. They’ve thrown the football by almost a 2:1 margin (309-167). Not surprisingly, the Steelers have gotten 70 percent of their first downs via the pass (109 of 155) this season. To provide perspective the Bills have converted just 48 percent of their first downs by passing (84 of 176). He was excused from Friday’s practice by head coach Doug Marrone and was listed as questionable for Sunday’s game against Pittsburgh. But Buffalobills.com has confirmed that LB Manny Lawson has made the trip with the team for tomorrow’s game against the Steelers. Knowing Lawson’s reason for missing Friday’s practice was not injury related the veteran linebacker is expected to start Sunday on Buffalo’s defense. The Pittsburgh Steelers are team that has endured injuries on par with that of the Bills this season. On Sunday they may be shorthanded at offensive tackle. While starting left tackle Kelvin Beachum was able to practice fully for the first time on Friday and is listed as probable coming off a knee injury, starting right tackle Marcus Gilbert is questionable with an ankle injury. One of their primary backups at offensive tackle is also questionable in former first-round pick Michael Adams. He was added to the team’s injury report on Friday with a rib injury. If Gilbert or Adams cannot go on Sunday veteran Guy Whimper would be the only other available offensive tackle. Bills LB Manny Lawson was excused from Friday’s practice by head coach Doug Marrone. The veteran linebacker is healthy, but his status for the game is a bit up in the air. As such Marrone did not give an official status for Lawson for Sunday’s game at Pittsburgh, but it’s expected that he’ll be listed as questionable. Hamstring injuries can be tough, especially for wide receivers, who need to get to top speed, gear down, get in and out of breaks and accelerate again. That puts a lot of stress on hamstrings, but Marquise Goodwin made good progress this week and looks like he’ll be available for Sunday’s game in Pittsburgh. Goodwin participated fully in practice on Friday after working on limited basis Thursday. “He’s good to go,” said head coach Doug Marrone, who listed his speed receiver as probable. Goodwin suffered a hamstring strain last week against the Chiefs in the second half. The rookie wideout has been the team’s most reliable deep threat thus far this season and also is the primary kick returner. Doug Marrone is expecting to have both EJ Manuel and Thad Lewis available for Sunday’s game at Pittsburgh. Provided they both continue on their current full participation path in practice there’s a good chance that third quarterback Jeff Tuel could be inactive Sunday. When asked if he’ll still dress all three quarterbacks, Marrone said he’s still weighing the options, but is leaning toward just keeping two active Sunday in Pittsburgh. The Pittsburgh Steelers have released their updated injury report following their Thursday practice and a couple of their players are back to full participation. Starting CB Ike Taylor was a full participant in his recovery from a concussion. Both Pittsburgh’s starting left and right tackles however, are still limited in practice. LT Kelvin Beachum has a knee injury, while RT Marcus Gilbert is dealing with an ankle injury. TE Heath Miller and C Fernando Velasco were back to full participation in practice. Part of the Steelers problems this season can be tied to their lengthy list of injuries. Pittsburgh saw three more starters go down last week against New England. The Steelers lost both CB Ike Taylor and LB Vince Williams to concussions. OT Marcus Gilbert left last Sunday’s game with an ankle injury. We’ll learn more about the status of those three players for Pittsburgh on Wednesday with the initial release of the injury report. 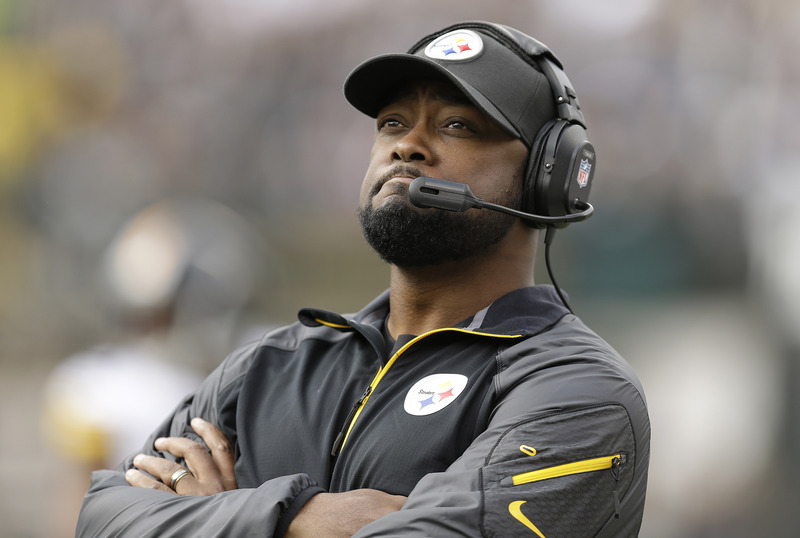 The season hasn’t gone as planned for the normally competitive Pittsburgh Steelers. Their 2-6 record has been a product of many problems, but after they had 55 points and better than 600 yards hung on them by the New England Patriots to set a franchise worst, Tomlin threatened to bench any player who weren’t bringing the necessary effort. According to the Pittsburgh Post-Gazette, this is the second time in five weeks that Tomlin has threatened to sit players who were underperforming. One of the few bright spots for Pittsburgh was Ben Roethlisberger, who threw for 400 yards and went almost blow for blow with New England’s Tom Brady, who threw for 432 yards. Here’s who will be on the call of the next two Bills games on CBS.